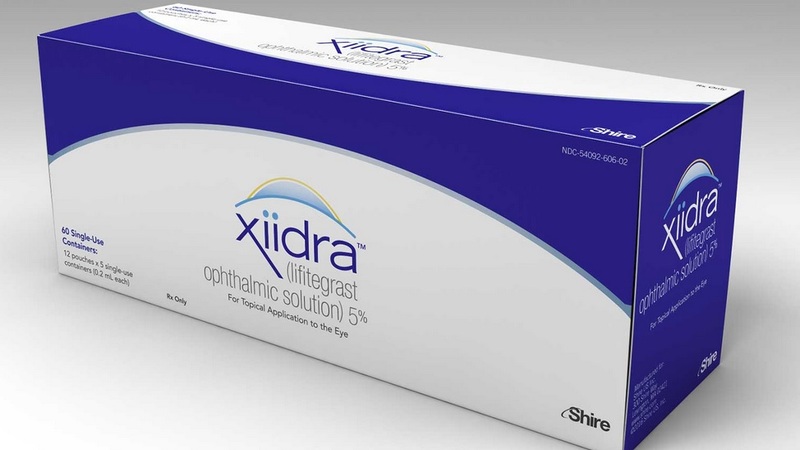 Xiidra/lifitegrast Cost, Side effects, Dosage, Uses for Dry eye. Xiidra is manufactured by Shire US Inc., of Lexington, Massachusetts. FDA has approved a new drug having active ingredient lifitegrast with brand name of Xiidra for the treatment of dry eye disease. This drug belongs to class termed as lymphocyte function-associated antigen 1 (LFA-1) antagonist. This is first kind of drug of its class approved for the treatment of dry eye disease. This drug is presented to FDA in the form of ophthalmic solution and marked as prescription only medicine. Dryness of eyes is a common problem in elder people due to decrease activity of tears gland. Dryness of eye itself does cause any harm or damage to eye but it increases the risk of eye ulcer, corneal injury, difficulty in blinking, vision problem etc. About 5% of individuals having age 30 to 40 years have problem of dryness of eyes while people with age more than 65 years have 10% occurrence rate. Most common reasons of eye dryness is inadequate production of tears or low consistency of ophthalmic fluid. These problem may arise due to extreme weather conditions like extreme hot or cold weather or too much air pressure. About 1100 individuals were selected to assess the clinical efficacy and safety profile of Xiidra/lifitegrast. It shows satisfactory results in four randomized controlled clinical trials. During these clinical trials patients received lifitegrast eyedrops or placebo eyedrops twice daily 12 hours apart for 12 weeks. FDA approved Xiidra/lifitegrast for treatment of dryness of eye in ophthalmic dosage form. Tin his drug is marked as prescription only medicine so you need a valid prescription in order to get this medicine. This drug was presented to FDA in ophthalmic dosage form with potency of 5% ophthalmic solution. Xiidra is now available in market with pack size of 60's. According to market survey initial cost or price of one box is about 400$ - 500$ that contains 60 ampules. This price may variate with the passage of time so, make it confirm by visiting your nearby pharmacy before purchasing. In adults, usual dosage frequency of xiidra is one drop into each eye after every 12hrs for 3-5 days depending upon the severity of disease. In children, xiidra safety profile has not yet evaluated.